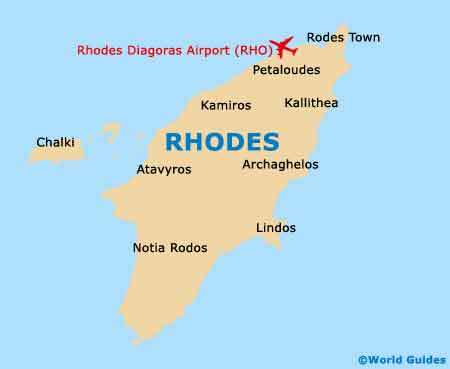 Appealing to all kinds of holidaymaker, the tourist attractions of Rhodes are quite varied. Families holidaying here will find that the Aquarium in Rhodes Town is filled with marine attractions, while other tourists prefer the underwater attractions beneath the surface of the sea itself, which can be views by snorkelling, scuba diving or simply by taking a cruise onboard a glass-bottom boat. Many of the best tourist attractions are spread around the island and reside within the various villages and resorts, such as Afandou, Lindos, Lardos and Pefkos, which include everything from top nightspots and restaurants, to a golf club and a stunning Acropolis. 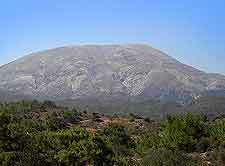 If you are feeling full of energy and looking for an alternative to the endless beaches around the coast of Rhodes, then do consider climbing Mount Attavyros, the island's tallest hill / mountain. Without a doubt, Lindos has become the number two resort on the island, after the Old Town area of Rhodes Town. 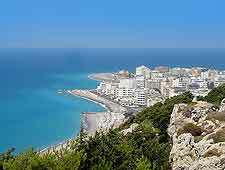 Each day, scenic cruises depart from Mandraki Harbour, located in Rhodes Town and on the very northern side on the island, sailing down the eastern coast until they reach the two bays of Lindos, in around two hours. Buses also connect Lindos with the island. Once you arrive at this resort, you will discover an array of historical attractions, such as bright white 17th-century houses with mosaic courtyards. Lindos is also home to bustling thoroughfares lined with shops and cafes, the 15th-century Church of Agios Ioannis and a rather famous Acropolis, which affords excellent coastal views and is perched atop a towering rock more than 100 metres / 328 feet high. Amazingly, Lindos was once a truly ancient city and dates as far back as 2,000 BC. Brimming with tanks and fishy attractions and located in Rhodes Town, next to the seafront, the very appealing Aquarium is housed in a historical Art Deco style building, once used as the town's Hydrobiological Station. More than 200,000 tourists visit the Aquarium each year, clearly showing its popularity. The Aquarium is highly suitable for families and houses all kinds of molluscs, crabs, sea turtles and colourful fish, along with some mounted sharks and other related exhibits, such as Mediterranean monk seals, star fish and toothed whales. Situated just below the village of Lindos, Lardos is another very notable resort on the south-eastern coast of Rhodes, and some 2 km / 1.5 miles inland from Lardos Beach. 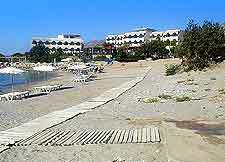 This resort is also close to Pefki, Glystra Beach and the Monastery of our Lady (Moni Agias Ypsenis). The central square of Lindos is really where the action is here and lined with cafes and bars, while the Italianate fountain known as the Era Vrissi provides a worthy centrepiece. 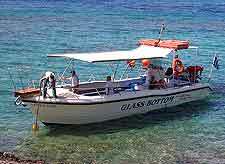 Cruises around the coastline of Rhodes is perhaps the best way to appreciate the beauty of the island's many bays, but by climbing aboard the 'Andrenalin' glass-bottom boat, you will also be able to take a look at the many surprising attractions beneath the water's surface. Cruises last for around three hours and travel between Kiotari to Lindos, stopped along with way at bays such as Kalithea, Anthony Quinn and Afandou, so that passengers can cool down in the water, by either swimming or snorkelling. Scuba diving is always popular with tourists holidaying on the island and with such crystal clear waters and a wealth of fascinating sealife attractions, it is easy to sea why. Within Rhodes Town itself, Mandraki Harbour contains no less than three individual scuba diving schools, Diving Centres, the Trident Diving School and Waterhoppers, all of which provide a range of different courses, including an inexpensive chance to try your hand at diving for just one day. The only official site where you can scuba dive near to the town is at Kalithea Thermi, although you can freely snorkel anywhere and everywhere. A small and very popular resort next to Lindos, the village of Pefkos offers a rather cosmopolitan flavour and started life an a small farming and fishing village. Today, Pefkos has grown greatly in stature and popularity, helped in no small part by its plentiful each attractions and pools. 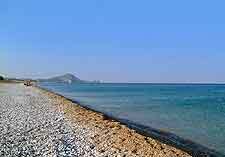 The Greek restaurants and fun nightspot in Pefkos are also worth a look. From Embonas, head towards Siana and then find a suitable place to park before you start your steep trek up Mount Attavyros. Take your time and enjoy the superb views, as you climb the 1,215 metres / 3,985 feet to the top of Mount Attavyros, which should last anywhere between two and three hours. 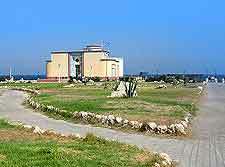 Look out for the museum, which houses an array of Minoan relics from an ancient temple that once stood here. Located on the north-easterly coast of Rhodes and sandwiched between the resorts of Faliraki and Kolimbia, Afandou is a very popular village with a length beach and an excellent golf course, amongst other attractions. The par-73 Afandou Golf Course features 18 holes and covers some 6,220 metres / 20,400 feet (6,800 yards) and is very established, having been here since 1973. The golfing fees are fairly nominal and clubs, balls and caddies are all available for hire.